Not too long ago, I was doing my typical late evening stroll through blogland... and I happened to make a comment on a friend's blog. Much to my great surprise, I was her 10,000 th commenter. Can you believe it, ten thousand comments.. now that deserves a big round of applause - way to go Carole! If you have never seen her blog, hop on over there - she's great! And a dramatic yarn made of 60/40 mohair-wool in a fabulous natural dye called Charcol. Carole, thank you so very much. Your creativity and care in the selection of these luscious goodies has given me a big smile. 10,000 comments - you go girl! And now - I begin to move my thoughts forward to a sweet new sock swap, run by Amanda - 2007 Bloomin' Feet. 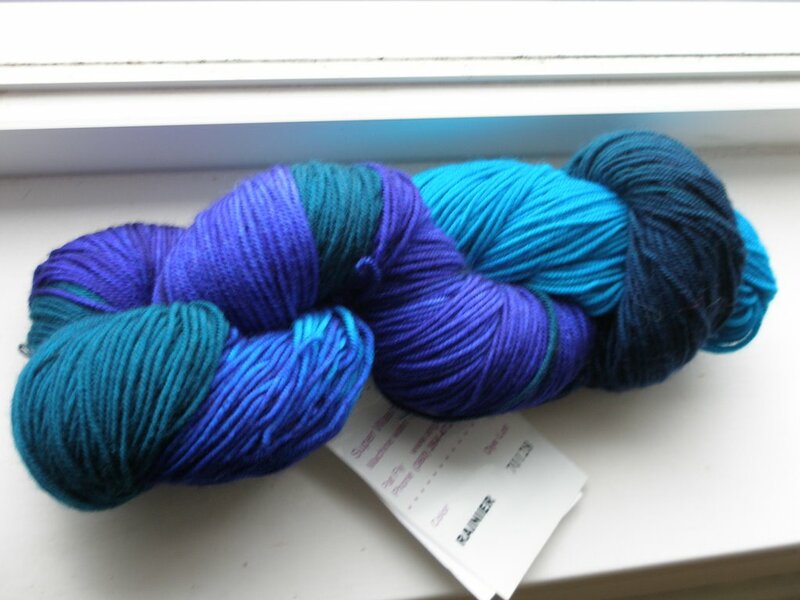 I have selected the yarn I will use, since my pal is a 'jewel-tone' kind of gal (so it appears from her blog). Here it is, in all it's glory - lounging lazily on my window sill - it must be a summer sort of yarn, since it loves the sunlight (and photos so poorly in the shade). It definitely is not shy - as it shouts boldly.. "pick me" from the pile of choices. This nice springy yarn reminds me alot of the BlueMoonFiberArts line - it is a three ply sport weight, and almost springs out of my hand. It's a new line of sock yarns that we are carrying on our website, hand dyed by local artist Pat Fly of Angora Valley Fibers. The colorway is called Rainier. I haven't yet chosen the pattern I will use. I'm considering "Monkey Socks" or a feather-type pattern, or maybe a cable/rib design... I'll keep you posted. and the bf yarn is GORGEOUS! the jewel tone thing...hmmmm...could you be knitting for me again? i'm wearing the socks you knit me right now actually. and while outside with the kiddos enjoying the afternoon sun the Princess came up, sat by my feet and said, "mama, there's Mardi Gras in your shoes!" and ya know, she was right! 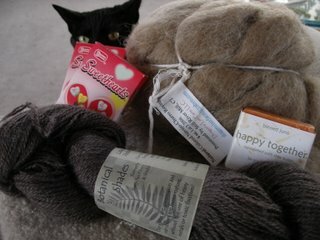 Lovely fiber and yarn, and I see that you have a "helper" too! Oooo, that's a nice colorway. You have a lucky pal. And I really like the yarn. That's one I've been considering for my pal, too, who also likes jewel tones. You can never go wrong with a cat in the picture. Not that Carole's faboo package needs a cat, I'm just sayin'. And the Rainier yarn? Wow, that's gorgeous! I'm happy you were happy with the stuff. I tried to choose things you wouldn't have access to yourself. The Bloomin' Feet yarn is gorgeous. What a lovely package from Carole. I love the yarn you chose for your Bloomin' Feet pal! What a great surprise package! I really like the yarn you will be using for your BF pal. I think the Monkey Socks pattern would be perfect for it. I would like to make that pattern myself one of these days. The yarn you chose for Bloomin' Feet is gorgeous. If that came into my house I'd have to put it under lock and key because my girls would try to swipe it. I think those colors are pretty popular because my pal is also infor jewel tones. The treats from Carole are great. Enjoy them! I love the blue! it is so clear and beautiful. We should have a contest to try and match up who's knitting for who. Gorgeous sock yarn - the blues are amazing!! And congrats on being Carole's 10,000 commenter - the ears and eyes were the first thing I noticed in that picture. Looks like trouble to me! The Rainier colorway is gorgeous! Your pal is sure to be very pleased! I know I would!! Of course, the kitty is innocent. It is your fault that you placed the toys within reach. And I love the yarn you have picked for your socks for Bloomin' Feet. Congrats and the blues are great! Thanks for the comment on my blog. I love your yarn selection as well. Very "jeweled"! Congrats on the goodies from Carole. Love those blues!! I'm envious of your sock partner! That box of goodies is wonderful! I do particularly like the mischievous eyes and ears perking up over the edge of the pile . . . Boy are you one lucky commenter! Love the goodies you got. Yowser to the Rainier...definitely going to have to take a walk on over to the shop pronto! What wonderful package! That yarn is gorgeous. You have one lucky pal! Carole sends yummies. Navajo-Churro is unusual roving, and fun to spin. I love the blues! Georgous deeply drenched colors. What fabulous treats! And I love that sock yarn -- so pretty! Lovely yarn! I love the name of the colorway. From your house you could knit and sit looking at the mountain. That way you'd have a truly Rainierian sock. And what a great gift :-) 10,000 comment is quite a feat. What a special surprise package! I love the kitty in the background. The sock yarn is beautiful...I wonder what it will become?